Ten years after the signing of historic peace accords whose goals were never achieved, Yasser Arafat said Saturday the Mideast conflict is facing its most difficult point since and he urged Israel to return to negotiations following its threat to exile him. Supporters filled Arafat's compound Saturday to rally around their leader. They included a government-organized demonstration of more than 2,000 school children, followed by thousands of adults. Some pledged to act as human shields to defend Arafat from Israeli troops. "Why do they interfere in our affairs and want to expel our leader? It will only happen over our dead bodies," said Adnan Awad, one of two dozen Palestinians camping outside Arafat's office. The Palestinian leader emerged repeatedly from the office of his partially destroyed compound to greet the crowd  beaming, blowing kisses and flashing "V" for victory signs. It was a stark contrast to the signing of the Oslo Accords on Sept. 13, 1993, when Arafat shook hands with then-Israeli Prime Minister Yitzhak Rabin on the White House lawn in the presence of President Clinton. 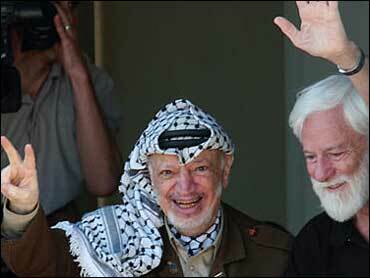 Israel blames Arafat for the collapse of peace efforts and says he has failed to stop terror attacks on Israelis. After two suicide bombings that killed 15 people this week, Prime Minister Ariel Sharon's security Cabinet decided in principle to "remove" him. The vaguely worded decision seems to leave open the options of exiling, killing or arresting Arafat  or further isolating him in the office where he has been confined for 18 months, with his phone lines cut and visitors barred. "At this moment we are really facing the most difficult moment that we have faced since the signing of Oslo in 1993," Arafat told foreign diplomats at his headquarters. "The problem is not just my problem and the threats that Israel has made to eliminate or to remove me. "The problem, the real danger is the intent of the Israeli government to cancel the Palestinian partner and to eliminate the presence of the Palestinian Authority." Turning his comments to Israel, he said, "Come to peace, come to make peace together." Thousands of Palestinians have rallied in recent days to support Arafat, and Palestinian officials have warned that a move against their leader would carry disastrous consequences. But Raanan Gissin, a spokesman for Sharon, said Arafat has not delivered on years of pledges and called him an "arch-terrorist." "We want to remove this obstacle to peace ... to renew the process of reconciliation between the two peoples," Gissin said. "As long as Arafat is around, that process is dead." In his speech to a dozen diplomats from European, Asian and Arab countries, Arafat urged pressure on Israel to end its killings of militant leaders and stop settlement-building in the West Bank and Gaza  areas Israel captured in the 1967 war from Jordan and Egypt, respectively, and which Palestinians want for a state. The Oslo Accords, which followed months of secret talks, included mutual recognition between Israel and Arafat's Palestine Liberation Organization, and allowed for the creation of a Palestinian autonomy government in the West Bank and Gaza. Tough issues  the fate of Jerusalem, Jewish settlements, Palestinian refugees  were left for "final status" talks. Arafat returned from a quarter century's exile in 1994 and two years later was elected to lead a Palestinian Authority that ultimately ruled over two-thirds of Gaza and almost half the West Bank  in disconnected islands of territory that included the vast majority of the areas' Palestinian population. But the final status talks fell apart about three years ago. Arafat did not accept then-premier Ehud Barak's offers of a Palestinian state in Gaza and most of the West Bank, with a foothold in Jerusalem  and Israel rejected the demand for a "right of return" for refugees and descendants. More than 800 Israelis and some 2,500 Palestinians have been killed in violence since then, and Israel has reoccupied much of the autonomous territory. Israeli newspapers ran retrospectives on the Oslo Accords, with most commentators blaming the Palestinians for rejecting a reasonable offer and turning to terrorism. But some noted Israel's own failure to build trust, with the Jewish settler population in the West Bank and Gaza doubling in the past decade to about 220,000, alongside 3.5 million Palestinians. Others saw Rabin's 1995 assassination by a Jewish ultranationalist opposed to peacemaking as the turning point. The 1994 Nobel Peace Prize went to Rabin, Arafat and then-Israeli Foreign Minister Shimon Peres. But many critics say a decade of peacemaking has led nowhere. "It's the Oslo criminals who got us into this mess," said Moshe Livni, walking in Jerusalem. "They are the ones who gave the terrorists the guns with which to kill Jews." In a poll in the Maariv daily newspaper, only 31 percent of respondents said the Oslo Accords should have been signed, and 54 percent said it was a mistake. The poll of 597 Israelis had a 4 percent margin of error. But in a rueful article entitled "Where we might have been," the mass-circulation Yediot Ahronot daily compared the three years of prosperity that followed Oslo  Israel's economy grew more than 25 percent  with the malaise, bloodletting and economic collapse of today. "There was hope. There was a euphoric feeling," wrote Sima Kadmon. "We sat in cafes. We didn't call our kids every five minutes ... We started to believe we'll be a normal country one day." Over the past three years, Israeli salaries have plummeted more than 10 percent. Tourism has collapsed and hundreds of thousands are jobless. On the Palestinian side, about half the work force is unemployed and Israeli travel restrictions turn the simplest trip into a logistical nightmare. In Gaza City, thousands marched in support of Arafat on Saturday for the third straight night. Hundreds also demonstrated in the West Bank. There also were voices in Israel urging restraint. Peres, now leader of the opposition Labor Party, told Israel Radio the idea of removing Arafat is "decidedly mistaken." In Nablus, meanwhile, an 80-year-old Palestinian man died from bullet wounds, said doctors at Rafidya Hospital. Fathi Bolbol was shot when he apparently went to the window after hearing a gun battle between troops and Palestinian gunmen, his son, Bashar, said.